We all like the convenience of electrical energy. It lights our home and offices, and drives motors that are needed in heating, ventilation, and air conditioning systems that keep us comfortable no matter what the temperature is outside. It’s essential for refrigeration that secures our food supply. In short, it makes modern life with all its comfort and conveniences possible. However, most electricity is generated from burning fossil fuels such as coal or natural gas, leading to carbon dioxide emissions that could be responsible for climate change. In many circles there is a comforting belief that renewables such as solar and wind can replace fossil fuel electrical generation and leave us free to live as we do without carbon dioxide emissions. Fundamental physics and engineering considerations show that this is not so. Power needs fluctuate with time of the day and, to a lesser extent, day of the week. In most places, peaks occur in the evening when people come home, start cooking, and turn on lights and entertainment systems. In Arizona in summer, the peaks are even more extreme due to the air conditioners all cutting in. There are also morning peaks, as people get up and turn on lights and hair dryers. Commercial and industrial use generally doesn’t change much throughout the day. The electrical utilities call this a baseload. 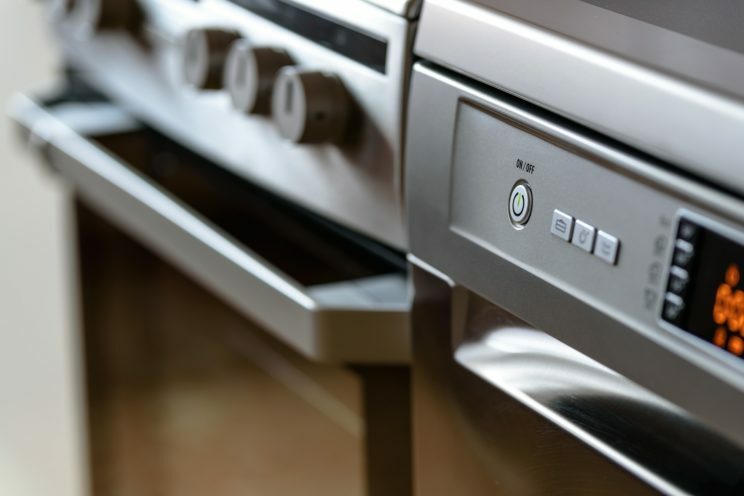 Household appliances by Photo-Mix. CC0 public domain via Pixabay. The wicked capitalist-monopoly electric utilities have spoiled us; we’ve gotten used to the idea that we can turn on the lights at night and run an electrical appliance at any time we want. Since electrical energy cannot be stored in sufficient quantities, the utilities are always continuously matching supply and demand. Power generation systems that take a long time to ramp up or down, like nuclear or coal, are left running continuously and used to meet baseload demand. Fast response turbines using natural gas are typically used to match peaks. Solar and wind present two problems. One is low power density; massive areas have to be devoted to power generation. The other, more serious problem is intermittency. If we only wanted to run electrical appliances when the wind is blowing or the sun is shining, fine, but don’t expect to use solar to turn on your light at night! So solar and wind cannot manage on their own; it’s always solar or wind AND something else. It’s hard to make it all work. They need either extensive storage or to be used in combination with gas turbines. On a large scale, the only practical solution is pumped hydroelectric, where water is pumped uphill when there’s sunshine or wind and runs downhill to generate electricity when the wind stops blowing or the sun doesn’t shine. In many places, the extended sunny days are in the summer, the windy periods are in March and October, but the electrical energy is needed in the winter. In such cases, very large reservoirs are needed, comparable to the 250-square-mile lakes like Lake Mead and Lake Powell. Very few places meet these conditions. So in practice, solar and wind have to be combined with gas turbines to deal with the drop in electricity generated when the sun goes down or the wind dies away. If the solar or wind displaces coal it results in a reduction in carbon dioxide emissions. However if solar or wind displaces nuclear that cannot be ramped up and down, more carbon dioxide is emitted because gas turbines have to be used when the sun isn’t shining and the wind stops blowing. Displacing the highly efficient combined cycle natural gas power plants, on average, results in no change in emissions. The gains from not running the fossil fuel plant when the renewable is available are offset by the losses from running the less efficient gas turbine on its own when the renewable is not available. Carbon dioxide emitted in metric tonnes (t) per person per year. Data from Energy Information Agency for 2006-2013. The data for 2014 and 2015 was calculated from coal, oil, and gas consumption in the BP statistical review (2016), appropriately scaled to match the EIA data in 2006-2013. One can easily verify this claim by looking to Germany, which has been in the forefront of adopting solar and wind in their Energiewende or energy transition. There is now as much solar and wind generating capacity in Germany as coal and natural gas. Has the increased reliance on renewables made any difference in Germany’s carbon dioxide emissions? Evidence suggests it hasn’t changed very much. 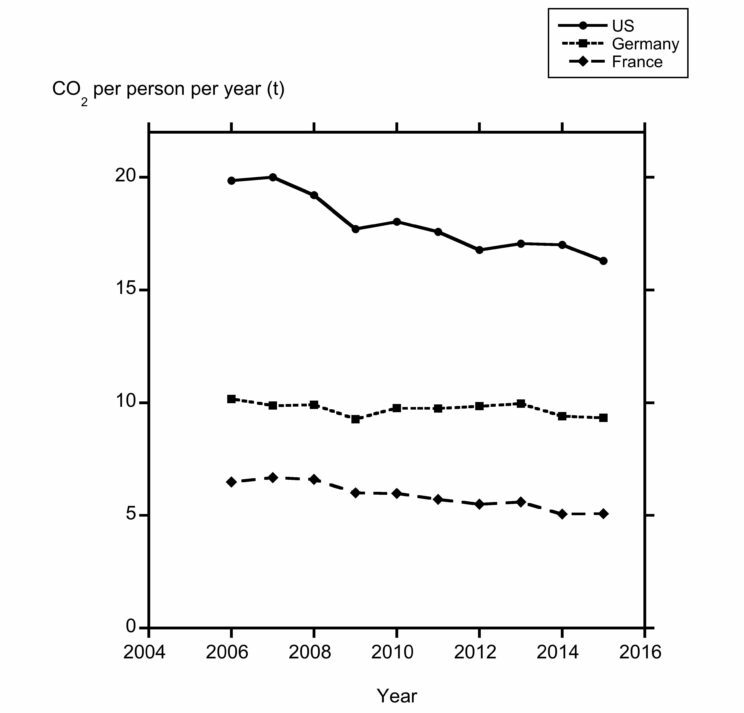 The careful reader may note that the French emit less carbon dioxide per person than the Germans and attribute it to the fact that the Germans are busy churning out BMWs and Bosch appliances, while the French lounge around on extended lunch breaks. However, the reality is more prosaic. The French baseload is almost completely nuclear with negligible carbon dioxide emissions. If one really wants to reduce carbon dioxide emissions the best thing to do is substitute nuclear power for coal. However, that path is not available in the United States, where nuclear is a four letter word. Instead, we have achieved significant reductions in baseload carbon dioxide emissions over the last decade by substituting high-efficiency combined cycle natural gas for coal burning plants, a change made possible by the low cost of natural gas from fracking. The carbon dioxide emitted for each unit of electrical energy generated is approximately three to four times lower than in the corresponding coal-fired power plant, resulting from the higher thermal efficiency (50-60%) of combined cycle natural gas, compared to coal (30-35%) and the greater amount of energy from natural gas for a given quantity of carbon dioxide emitted. To make a real difference one has to make a serious impact on the baseload. Intermittent renewables can’t do this, which is why they won’t significantly lower carbon dioxide emissions. Featured image credit: Industry by Foto-Rabe. CC0 public domain via Pixabay. Peter Rez completed his bachelors degree in Cambridge and his PhD on Theory of Electron Scattering in Electron Microscopy, in Oxford. He has worked in industry on computer control and data acquisition in electron microscropy. He's been a professor at Arizona State University since 1985. His interests have broadened over the years and include energy policy. 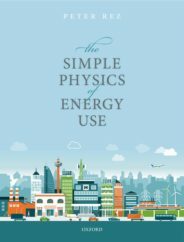 He is the author of The Simple Physics of Energy Use (OUP, 2017). It’s not just about C02. It’s also about ozone, particulates, sulfur dioxide, carbon monoxide. So tiresome — and simplistic to focus only on C02. And, btw I don’t believe a word of your one sided, fossil fuel shill argument. Peter, thank you for a thoughtful article on the realities of renewable energy and carbon dioxide emissions. I came to the same general conclusion many years ago, which is why I have invented an energy storage and conversion technology that can actually solve this problem. More information is available on my company website, zietllc.com. If you would be kind enough to visit my website, I would appreciate your feedback. The analysis overlooks the possibility of nuclear energy that can load-follow. New versions of nuclear design are coming that will no longer only be for baseload provision. Molten salt reactors are a good example. MSRs will be cost-competitive with fossil fuel combustion and offer high levels of grid flexibility, offering a non-carbon-emitting alternative to natural gas. It is not just physics and engineering. In order to understand the big picture, one must include history, society, infrastructure, use of water, how the electric sector is organized etc… Climate change is a complex problem, so no simplistic solution – like the ”substituting this for that’ idea – will be enough to deal with it. Germany gives a great example of being simplistic: wind and solar distorted their energy market without being effective regarding emissions. This seems at first to be a plausible argument. If the thermal efficiency of a modern combined cycle gas turbine is 54%, and that of a single cycle gas turbine operating at part load is 27%, then (for example) an equal mix of Renewables and gas turbine back up will yield no net CO2 reduction. This particular article focuses on the reality of non-storable intermittent renewable sources, and why they remain characterized by the US EIA as unreliable. It is not about pollutants by type. It does not intimate that in the longer run they may have higher value. Once the challenges of storage are overcome, and become cost effective….and folks opt to actually invest in storage and backup, this scenario will change……but still far from reality at this time. Renewables are intermittent, and tend to be backed up by necessity by instant-on carbon based aeroderivatives/peakers, which on a net basis are far more polluting than what they displace. Until cost effective and large scale storage are a reality……this technology holds promise, but is 1/4 developed. Neglected to mention compressed air energy storage. One is operating in the US and the other in Germany. The evidence shows that the fossil-fuel interests have promoted wind & solar for the same reason they have supported antinuclear activism. They know what does, & what does not, threaten their market share. Too bad there’s so little concern for humanity as a whole or our global environment. Using the right solar technology and the right battery solution will create a baseload! CSP Dish is proven to have the highest conversion rate Solar to electricity 32% in combination with a low cost thermal battery its possible to reach as low as $4-6 cents per kWh on electricity delivered during the dark hours. Long term solar interruptions will be avoided by a hybrid solution adding heat with gas. Check United Sun Systems. Chris, you forgot to mention heavy-metal contamination of the groundwater. I talk about carbon dioxide because according to the IPCC it’s the dominant anthropogenic greenhouse gas. The other things you mention have specific causes and specific solutions. I think the operative word in your last sentence is “believe”. I would welcome a refutation using quantitative reasoning based on established facts. Developments in nuclear and storage are all welcome. Let’s see how they scale up to meet the needs of developed countries. You raise an interesting point. I think its related to the capacity factors. The Texas panhandle is a very windy place where winds are frequently in excess of 11-12 m/sec so wind farms can generate their rated output. A simple analysis would suggest that when displacing combined cycle gas turbines from baseload the capacity factor of the renewable has to exceed 33% for there to be a net lowering emissions. This can actually happen in the Texas panhandle. However it’s one of the few places in the world where such high capacity factors are possible. It’s true that cutting back on nuclear hasn’t helped in reducing German emissions. They started with about 20GW of nuclear capacity of which 10 GW has now been shut down. I estimate that’s responsible for 1t out of the 10t of CO2 emissions per person per year. I agree. It’s the sheer magnitude of the storage required that’s the issue. For a place like Phoenix AZ or Los Angeles CA where one only has to store for a day or so, 100’s of GWh of storage are needed. For a country in Northern Europe (UK, Germany) it’s more like 100’s of TWh. Meaningless acts of symbolism with batteries aren’t going to make a difference. Mr. Musk’s donation of 129 MWh of batteries for the 300 MW Hornsdale wind farm in South Australia provides about 25 mins of storage. Compressed air storage is an interesting possibility, but I came to the conclusion that it’s easier to meet the challenge of the magnitude of storage required using pumped hydroelectric. Lars: You are correct, in principle CSP has a higher efficiency. This translates into a smaller footprint to generate a given peak electrical power. The low cost of PV panels means that it’s hard for CSP to compete, even if it does take up less space. The other issue is whether the tracking associated with CSP (though it could also be done with PV panels) is worthwhile. A simple analysis would suggest that the direct/diffuse ratio of the sunlight has to exceed 64%. Even in desert climates a combination or dust and high clouds make it hard to exceed this threshold all the time. Article ignores tidal and geothermal power generation both of which do not suffer from “intermittency” Since most humans live near the coasts a robust use of tidal (Lunar) power could impact CO2 emissions a great deal. Additionally geothermal power is virtually unlimited and endless in many parts of the globe. Initial investment is high but the payoff goes on forever. In simple terms the numbers for tidal and geothermal don’t work. Tidal is a form of hydroelectric power, energy ultimately is extracted from a change in height of a large mass of water. Tidal ranges are in the range of a few meters, small compared to the drop of hundreds of meters associated with hydroelectric dams. That means tidal basins have to be massive compared to the large lakes behind dams. The tidal scheme in La Rance, France, has a 22.5 km2 basin and generates a few hundred MW, about the same as a medium sized gas turbine. Geothermal comes in two forms. There’s the use of steam generated from magma heating underground water reservoirs in volcanic regions. The temperature is not that high compared to the steam temperature a modern turbine and the thermal efficiencies are quite low, maybe about 10-15%. The problem is that there aren’t that many places in the world where this is possible. Geothermal energy also comes from the decay of radioisotopes in the earth’s crust, “hot dry rock geothermal”. The power densities are very low, milliwatts per square meter, thousands of times lower than the power densities from photovoltaic solar, for example. To extract this energy is hard, it requires very aggressive fracking of large areas of rock at depths of a few kilometers. So the moral is: we’re just prisoners of the habits that the fossil fuel industry has created in us so just accept that they have created the end of technological exploration re. problem solving and go quietly into that good night ? I.e. just drop all research on batteries or alternative storage solutions like flexible flywheels because it’s hopeless by decree. Why does no one mention the obvious choice for a planet such as our Earth: hydrogen energy cycle & storage combined with fuelcells.